Artist's conception of the European Space Agency's Gravity field and steady-state Ocean Circulation Explorer (GOCE) satellite in orbit. The $450 million satellite launched in 2009 to study Earth's gravity field in unprecedented detail and will fall to Earth in 2013. A European satellite met its fiery doom in Earth's atmosphere late Sunday (Nov. 10), succumbing to the same gravitational pull of the planet that it spent the last four years mapping like never before. The European Space Agency's GOCE satellite fell from space Sunday at 7 p.m. EST (0000 Nov. 11 GMT) while flying on a path that would take it over Siberia, the Western Pacific Ocean, the eastern Indian Ocean and Antarctica, ESA officials said. The spacecraft was about 17 feet (5.3 meters) long and 3.2 feet (1 m) wide, and weighed about 2,425 pounds (1,100 kilograms). The xenon-ion propelled spacecraft was billed as the "Ferrari of space" for its sleek, aerodynamic design and low orbital path during its mission. "While most of the 1,100 kg satellite disintegrated in the atmosphere, an estimated 25 percent reached Earth’s surface," ESA officials explained. GOCE mission managers and scientists with ESA's Space Debris Office and the Inter-Agency Debris Coordination Committee kept a close watch on the satellite's re-entry. According to those updates, GOCE appeared to surprise scientists by beaming data to Earth almost until its end. 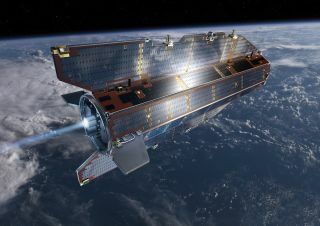 The 350 million euro ($467.8 million) GOCE, the name is short for Gravity field and steady-state Ocean Circulation Explorer, launched into space in 2009 and spent four years mapping the Earth's gravitational field and oceans in unprecedented detail. GOCE ran out of its xenon ion fuel in October, committing itself to a fiery demise by re-entering Earth's atmosphere. GOCE's fall from space is the latest high-profile example of a spacecraft falling uncontrolled from space. In 2011, NASA's defunct Upper Atmosphere Research Satellite fell to Earth over the Pacific Ocean. It was followed later that year by Germany's ROSAT X-ray space observatory, and then by Russia's ill-fated Phobos-Grunt Mars probe, which failed to leave Earth orbit after launch and fell back to Earth in January 2012. In 1979, NASA's massive Skylab space station fell to Earth and rained debris over parts of Australia, though no injuries were reported. "The one-ton GOCE satellite is only a small fraction of the 100 to 150 ton of man-made space objects that reenter Earth’s atmosphere annually," Heiner Klinkrad, the head of ESA's Space Debris Office, in a statement. "In the 56 years of spaceflight, some 15 000 tons of man-made space objects have re-entered the atmosphere without causing a single human injury to date. Email Tariq Malik at tmalik@space.com or follow him @tariqjmalik and Google+. Follow us @Spacedotcom, Facebook andGoogle+. Original article on SPACE.com.